EmBug is our STAR, if there is a stage she is most at home, front and center. It’s not that she demands that attention off the stage, she’s actually very quick to disappear into a crowd, but when given an authentic stage, the audience, the script/song and the spotlight, she shines. Here are the top ways she “shined” in 2015. 14. February 26th EmBug presented twice at Techno Expo (Our School District’s Student Technology Showcase). She shared her Google Site of her Summer Reading Project and her group collaboration on Mechanical Energy. 13. Singing in any situation keeps EmBug’s spirits high and anyone else around her. Her rendition of “Don’t Rain on my Parade” in early March while doing the dishes entertained many when Kirsten posted on Facebook. 12. Performing as Dionysus, the main narrator, of the Greek Theater festival at her middle school at the end of March. 11. Performing at NISD Spring Solo and Ensemble and earning I’s in mid- April. 10. Performing in her last concert with, the children’s performance choir, Cantare’ on April 30th. 9. It began in May and was an amazing experience, and still is. EmBug now sings with the FOTP Worship Band during youth and adult services on various occasions during worship services. 8. 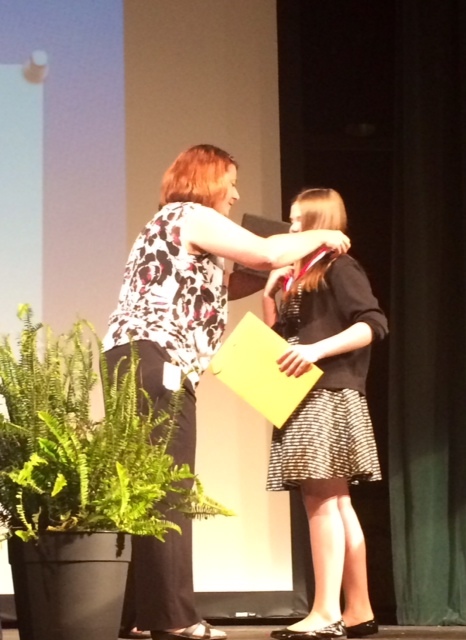 The end of 2014-15 School Year Awards EmBug earned Top PreAP 6th Grade Girl for Science and Top 6th Grade Girl Theater student. 7. May 31st she competed in the National Guild Piano competition… our pianist earned a Superior Plus Rating (national standing). She performed 10 songs fully memorized and perfectly executed before a nationally certified judge. 6. In June EmBug and Kirsten went on their first mission trip to Houston, Texas. The Houston Mission trip with Fellowship of the Parks (FOTP) Youth to the 5th Ward helping with Generation ONE was an amazing experience for both and are already making plans to participate in this year’s FOTP Youth Mission Trip. 5. Once again our thespian tried out for our district’s Middle School Musical and earned a part in the play “High School Musical.” She played the role of “Cyndra”- a very mislead self-proclaimed “opera singer.” It was a thrill to see her and her fellow cast come alive and deliver an outstanding performance that rivaled college theater performances. 4. This next mention can’t capture the hard work and determination that EmBug put into polishing her gift of singing. She started her 7th grade year in the 7th Grade Concert Girls Choir after trying out in the spring for Varsity Girls Choir and not making it. Her dyslexia has always required her to work harder and learn additional strategies to succeed at the highest level. At the tryouts the sight reading proved to be too much. Even though we thought that there was no chance to make it into the Varsity Choir in the fall, she worked all summer long to improve her sight reading skills. A change in staff in the choir department in August opened up the opportunity for an additional chance to try out and this time she made it into the Varsity Girls Choir with flying colors. However, the story doesn’t end there. She then determined that she would make the All Region Choir. In the midst of all preAP classes, piano lessons, musical practice, church volunteer work, youth group and family responsibilities she persevered and practiced. She tried out and made 4th Chair Second Soprano in the Highest All-Region Choir. A huge accomplishment for anyone but an even greater personal success for a 7th Grade girl who struggles with sight reading due to Dyslexia. 2. Teenager in the House! 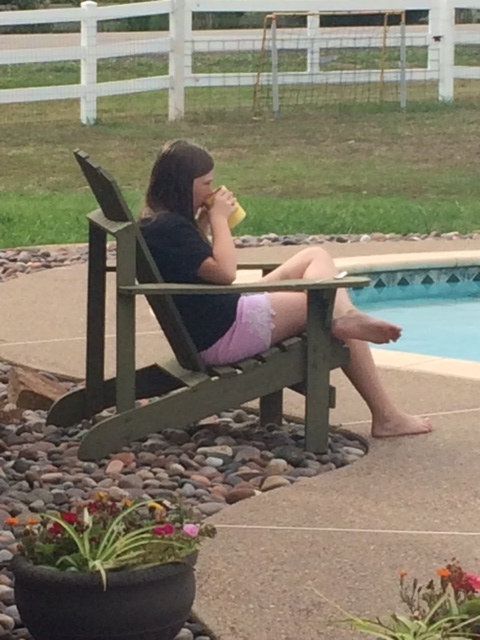 This year EmBug crossed the threshold into “teenager.” She is never without a creative thought or idea. Her celebration with friends this year was no different. She planned the whole outing, having her friends take a timed trip to Goodwill with $15 to find items to dress like a Christmas symbol or character they pulled from a hat. Then the entourage was chauffeured by Mama Wilson to the Fort Worth Stockyards where they completed the Maze… made famous by the Reality TV Show “Amazing Race.” This was followed by a “selfie” treasure hunt challenge also planned by EmBug. The night ended by watching “National Lampoon’s Christmas Vacation” and eating pizza. There was no lack of giggling and it was a memorable night for all the girls. 1. This year we added a new tradition to our Christmas Eve. Embug helped as part of a Candlelight Choir during our church’s four Candlelight Christmas Eve Services. As she grows up her activities change. What an awesome opportunity to watch her use her gifts to bring joy to others. What was more exciting was the opportunity for EmBug and Kirsten to sing in the last service together. There are many other items we could include. The dance where she “Wobbled” her way out of her knee cap. Her Student Council and Fellowship of Christian Athletes leadership and participation. Her work with the 3 year-olds at Church on Sundays. Her culinary curiosity that has led to many a prepared meal for the family. Even her winning the FOTP Youth Ugly Christmas Sweater Contest might be worth mentioning, but seriously, at this point only the grandmothers are reading this and it has to stop somewhere! She is an amazing daughter and we are so looking forward to every day and what it will bring. Here’s to another amazing year with EmBug! Christmastime is full of all kinds of traditions. Some traditions continue for generations and others for a season. The tradition of believing in Santa is for a season and all indications say this was the last year of true belief. We began the our Christmas Holiday break with Eric’s mom and step-dad, or as the kids know… Grammy Kelly and Gramps Dale, visiting from Florida. We were so excited for their arrival and visit, as they had never seen our new home in Haslet, nor had they been back to Texas since they moved away 7 years ago. 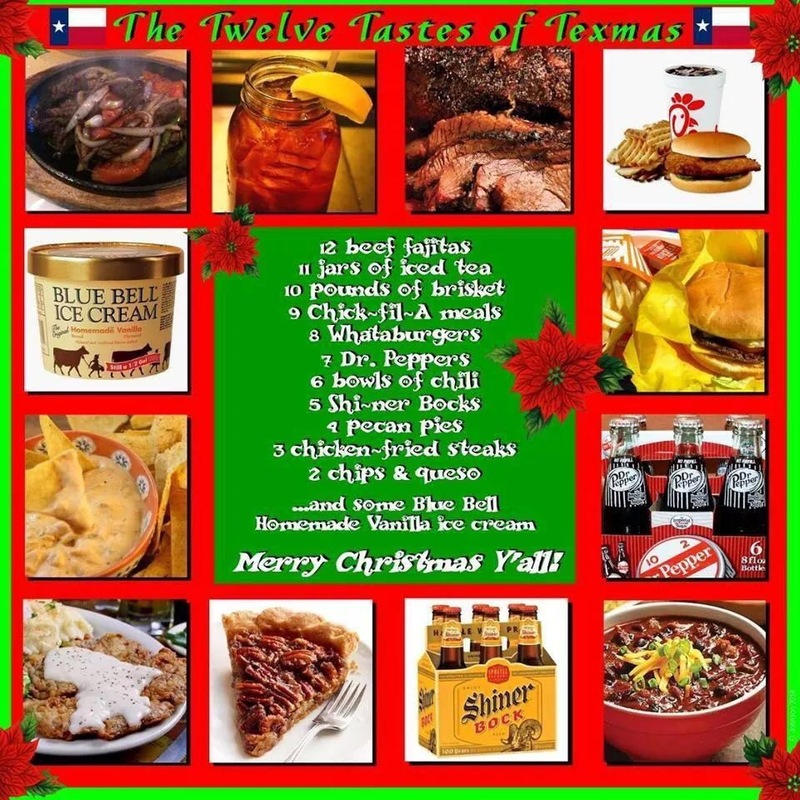 To make their stay extra special we had planned all our meals around a Texas Christmas theme. In addition to the yummy planned meals we enjoyed the comfort of a warm fire almost every day. 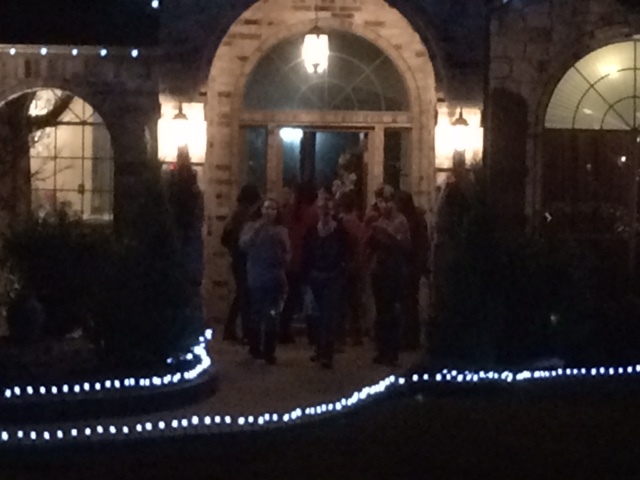 On Christmas Eve we baked and decorated cookies, attended Christmas services at Fellowship of the Parks- Haslet, ate our traditional Christmas Eve meal at our hometown Joe’s Pizza and Pasta and drove around the area enjoying the outdoor Christmas lights. Upon returning home we put out the reindeer food (dried oats and cookie sprinkles), plated the cookies and milk (egg nog at our house), and read the Christmas Story. Every Christmas Eve we relive the story through the nativity poem/interactive manger scene “What God Wants for Christmas.” In years past I would read the story and the kids would create the scene as the story unfolded. This year, the kids took over and read, unpacking the manger scene as they went. It was a precious site to see and while the tradition has evolved, the change a bit bittersweet, the tradition that was once mine to initiate, has now become part of Embug and Kritterman’s own fabric of Christmas traditions. Once we were all nestled all snug in our beds… Santa arrived stuffing the stockings and leaving presents under the tree. In his haste to depart a boot print of soot remained on the hearth and a subtle reminder that the bell still rings for those who truly believe. Every Wednesday after a time of worship and a message from the youth ministry team, I get to sit down and learn more about this amazing group of 6th grade young ladies. They are enthusiastic, energetic, generous, kind, considerate, compassionate, silly, goofy, dynamic and unique. At the beginning of December I challenged them to do random acts of kindness throughout the month. Every time we met they had wonderful stories of how they gave to others and their joy in giving was contagious. 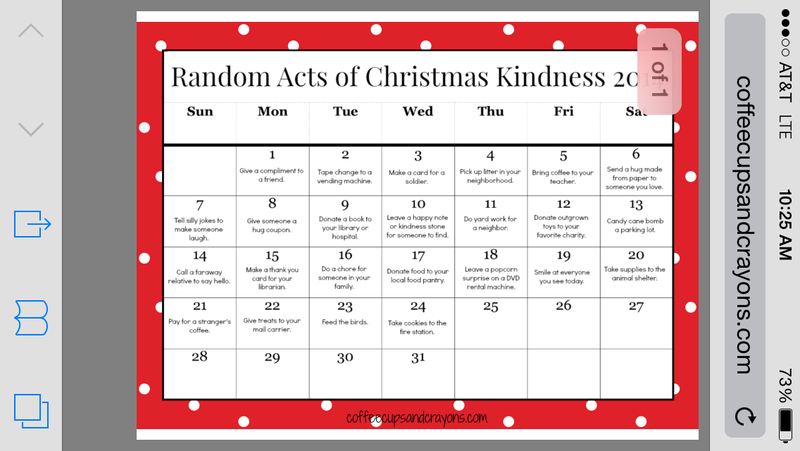 One of the ideas we considered as a random act of kindness was candy cane bombing. This typically is where you go to a parking lot outside of a grocery store or large warehouse retail store (i.e. Wal-Mart) and place candy canes on every windshield. While the idea itself is fun, as the adult in the conversation, I was concerned about the safety of all my girls that would participate. To appease the eagerness to do the candy cane bombing, we came to a reasonable alternative. 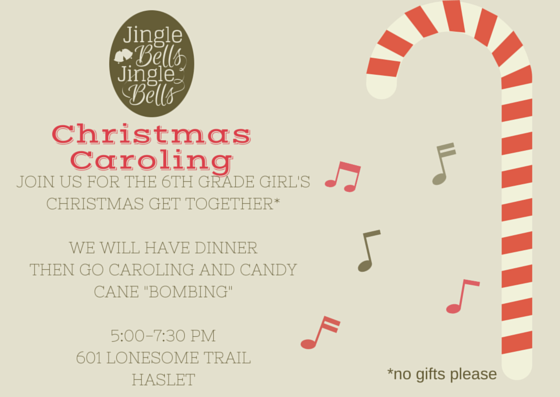 We would carol and candy cane bomb at the same time. So in celebration of the Savior’s birth and to provide an opportunity for these girls to come together socially outside of the normal weekly “Inception” meetings, I hosted a Christmas party. 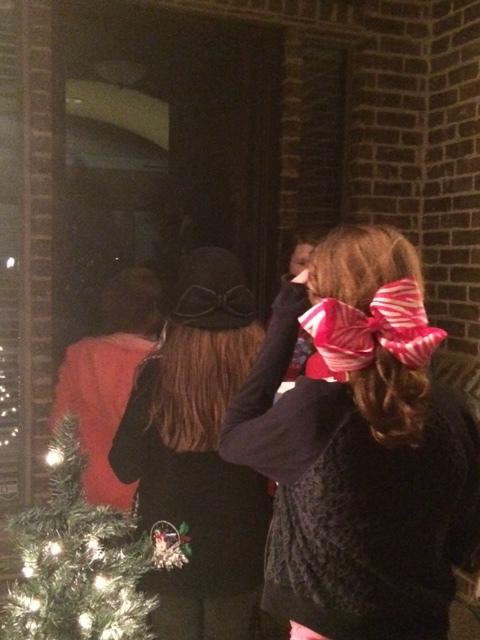 We grilled hamburgers, ate cake pops and then grabbed packets of carol lyrics and candy canes. This new twist on candy cane bombing was to go to every door in the general area of our home, knock and then begin caroling. 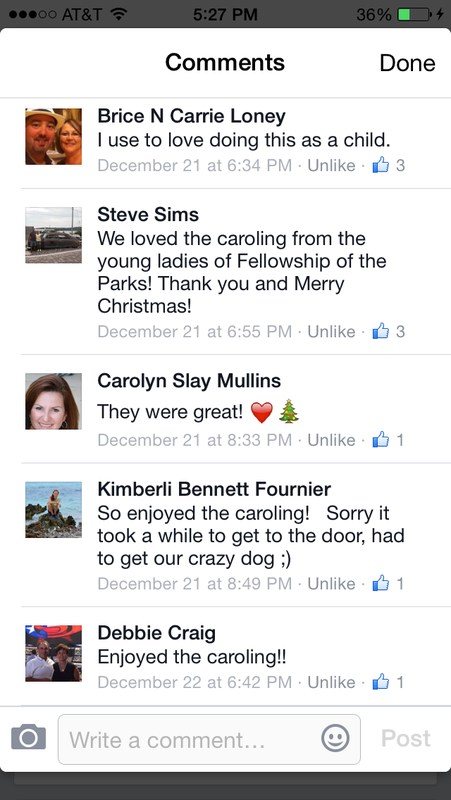 If a door opened continue the song to an appropriate stopping point then gift the audience with candy canes. If no door opened finish the carol and leave a candy cane on the door knob. 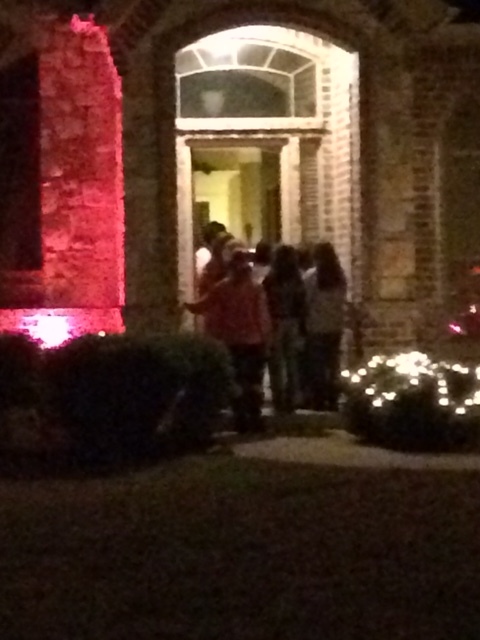 The event was a success and the young ladies loved it as much as the neighbors. What holiday activities from your childhood would you like to see re-emerge? There are many traditions that families have during this time of year. Some light an advent candle and have an advent calendar, others visit every holiday show and light display possible throughout the season, and others may do an Elf on the Shelf. 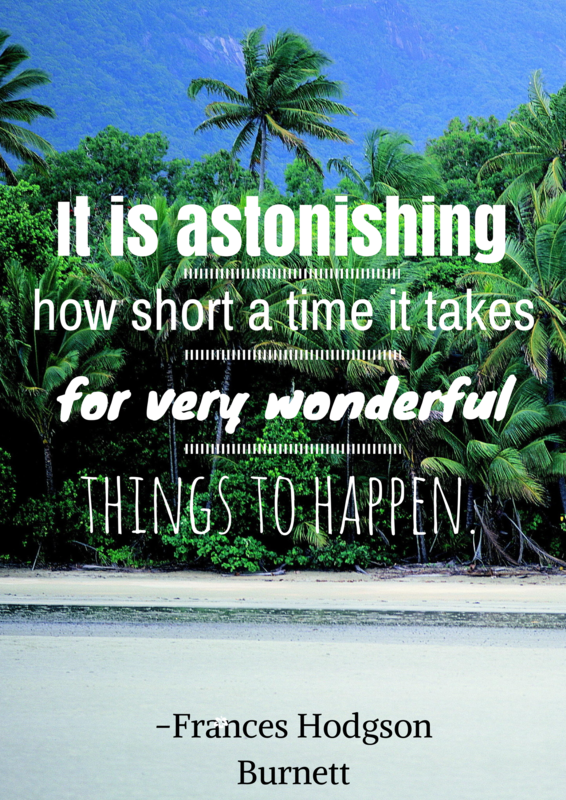 Whatever you do it is something your family looks forward to with anticipation. Some traditions are influenced by your childhood, others are new traditions that have been created as a unique part of your family. There are opinions about all of them and with the explosion of social media and blogs there is no shortage of said opinions. I have come to a point that I don’t pay attention to others’ opinions, but rather, focus on the house where my husband and I create a home for our family. One tradition, new to me but is part of my ethnic background, is Sinterklaus Day. Sinterklaus is the Dutch Santa or St. Nick. From what I have learned over the years Dutch culture and tradition separate the visit of Sinterklaus and the birth of Jesus. Sinterklaus Day comes early in the Christmas season while Christ’s birth is observed on the 25th. This white-bearded man, donning a long colorful winter coat, rides in on his horse late in the evening on December 5th. Dutch children leave their wooden shoes on the front porch with goodies for Sinterklaus’ horse in great anticipation. On the morning of December 6th children awake to find goodies such as succulent fruits and sweetbreads if they have been well-behaved; if not they find switches. The idea of the wooden shoe is believed to have evolved into the American tradition of hanging the stockings. 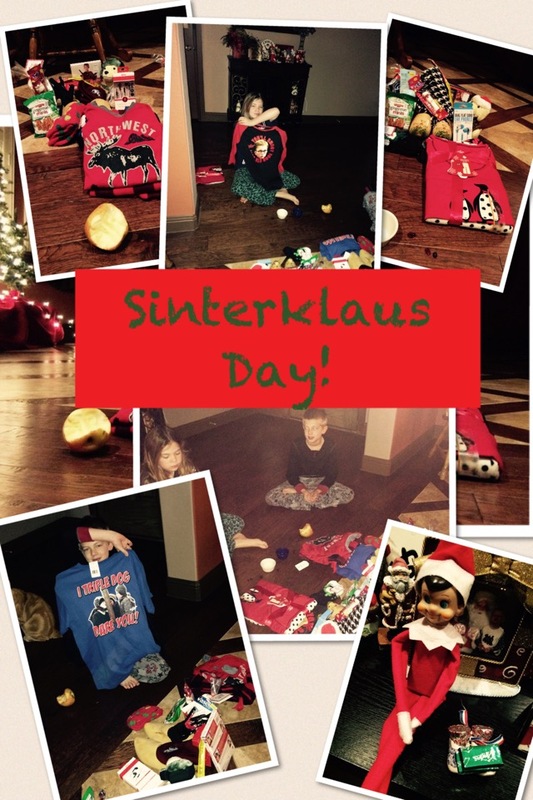 When my Daughter Embug was born we started celebrating Sinterklaus Day. While we do put out wooden shoes, they are not shoes we wear like the Dutch children. Embug and Kritterman enjoy leaving hay, an apple and carrots for Sinterklaus’ horse. On December 6th Sinterklaus usually leaves each child their Christmas PJs for the season, Christmas ornament, Christmas t-shirt or sweater, a Christmas Movie or CD, plus a variety of yummies and winter stocking caps/mittens. This tradition has become such a part of us that Embug and Kritterman were surprised when they found out from their peers that Sinterklaus did not visit their homes. However, Sinterklaus has made his way to homes of our friends in recent years once those children learned of his practices. 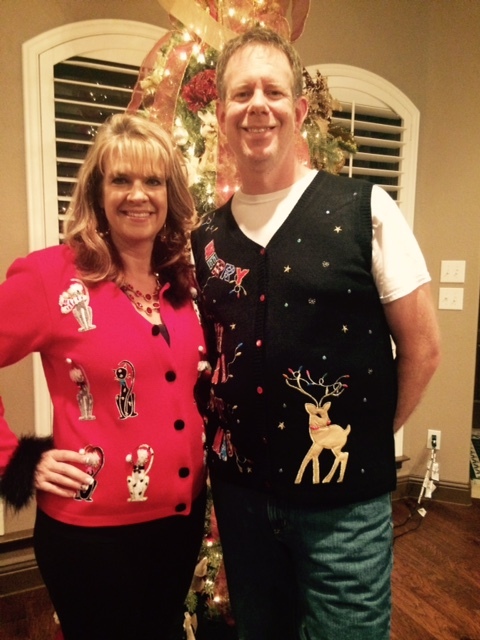 In addition to the tradition of Sinterklaus, the family has been caught square in the web of the Ugly Sweater themed Days and Parties. While there are too many events to recount, one party got Kirsten and Eric caught red-handed in the knitted disasters. How are you creating memories and celebrating new and old traditions in your family? I started this blog to capture the more personal part of my life. I have been blogging for over a year professionally. The problem is, I want to thoroughly process and present a perfect post…. EVERY TIME. What results… I don’t post. So I didn’t post about Embug’s volleyball team winning the 12U championship. 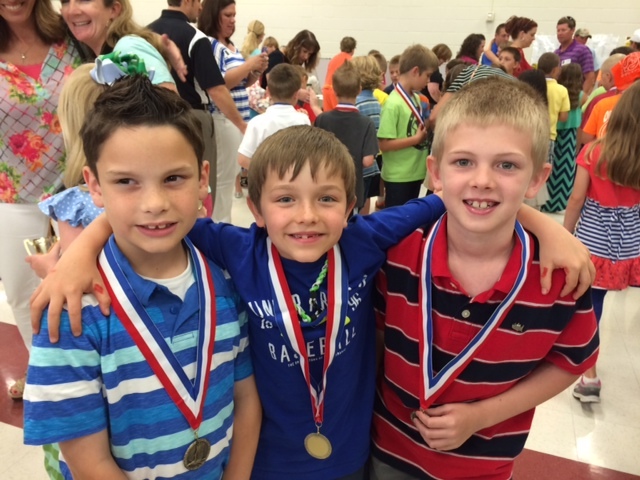 I didn’t post about the end of the year awards for the kids. 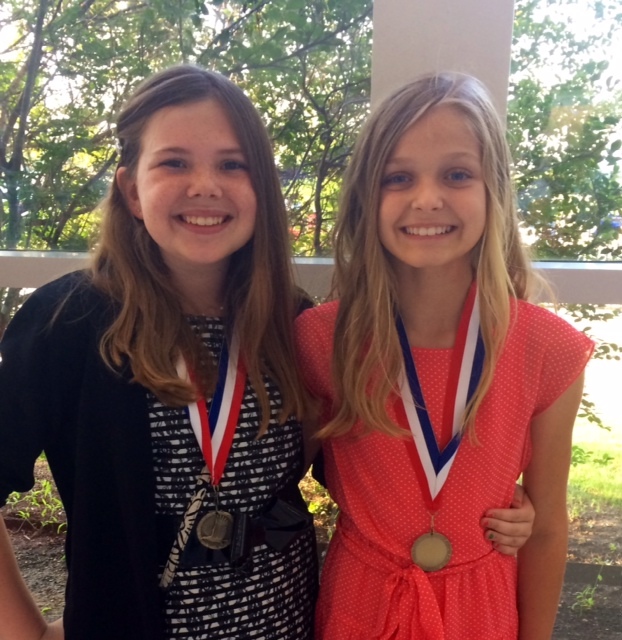 Embug with one of her besties… all smiles for these future Middle Schoolers! 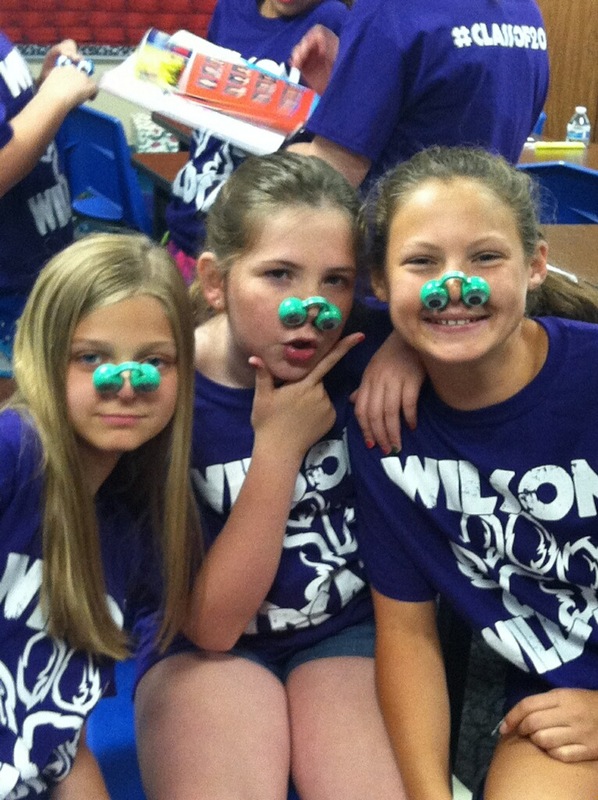 I didn’t post about the 5th grade clap out. The one most significant event that happens at Haslet Elementary on the last day of school to bid farewell to their oldest members of the student body. Silly girls getting ready to exit the building. 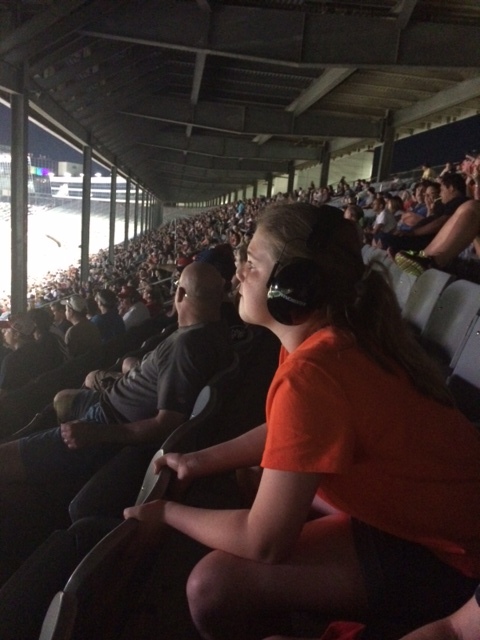 I failed to post Embug’s choir singing “God Bless America” at the Rough Rider’s game in the 7th inning stretch at Dr. Pepper Ballfield in Frisco. What I realize is that I am missing moments both big and small because I am waiting for the perfect time to create the perfect post. What’s the use of a blog if you don’t utilize it for what it was intended… right? So I plan to be more intentional with posting and less concerned about how perfect it looks. For your grammar, spelling and format wardens… I apologize if my errors annoy you. This blog isn’t for you anyway. It is ultimately a journal of memories and moments that capture the beauty, struggles and human moments of my life and the life of my family. It is a legacy for my family that I wish to share with the world… and as a way for our family far and near to have a window into our lives. Frankly, I am not the best and keeping everyone up to speed. Kritter explaining framerate to decrease lag in Minecraft. So here’s to capturing the real moments in life and learning from them. I love telling our story. 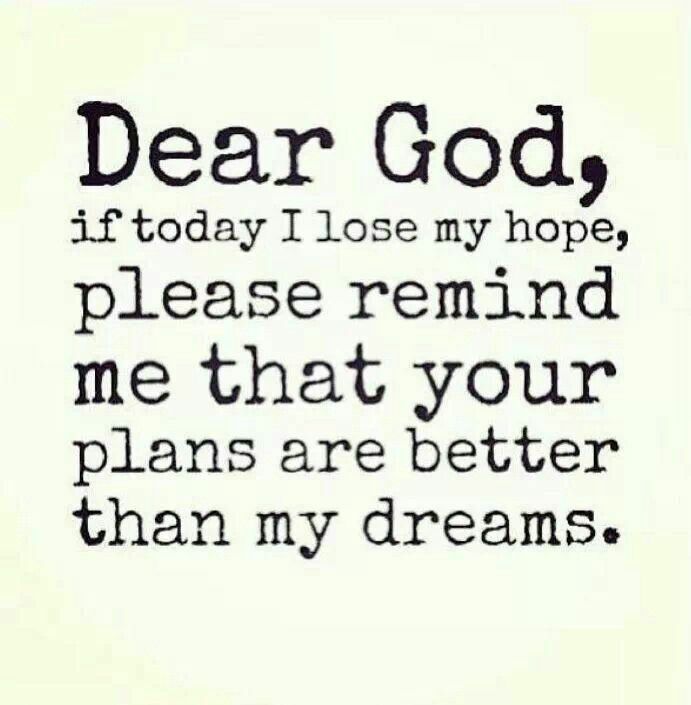 I hope you enjoy reading it.